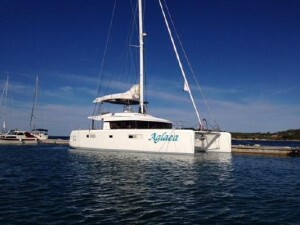 This Lagoon 500 is a meticulously maintained blue water catamaran. 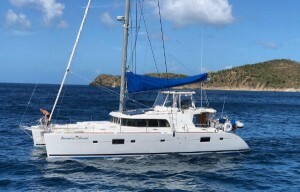 She was purchased in 2010 from the first owner and she spent most of her early years sailing in the Caribbean. In January 2016, ‘Paradise Found’ circumnavigated the globe, completing the World ARC in April 2017. Since then she has sailed in the Bahamas and in the Caribbean Sea and is presently sailing in the British Virgin Islands and will remain in the Caribbean until she is sold. 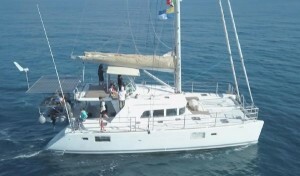 A 4-Cabin owners version yacht that is fully equipped with all required safety gear, communication and power management equipment, and spares required for blue water sailing. She is outfitted with 1500 watts of solar power, a Watt & Sea hydrogenator, AIS Transponder, and a 13.5 KVA Onan generator, new in 2014. This 2014 Lagoon 52 Flybridge with top specification and 3 cabin/ 3 heads owners layout is found in excellent condition having been professionally maintained. 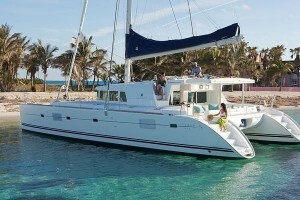 Ready to go cruising round the world, this exceptional Lagoon 52F is ready for a new owner. Replaced gel service batteries with 1,260-amp capacity and generator battery. 4 x 120W Flexible second generation solar panels. Full 2014 Raymarine I70 Navigation Package. TV to saloon with electric lift. TV to the owner’s cabin. Teak covering to the flybridge, aft and forward cockpits plus the transoms. Bimini with windscreen and clears for viewing the sails plus LED lights to the helm position. Canoe carbon boom with LED lights. Hydranet Triradial flat top mainsail. Mainsail stack pack with lazy jacks. Mylar Code-0 with furler and bowsprit. 3.90m Centre console tender rib with upgraded 60hp Honda outboard motor.